In April 1483 Leonardo signed a contract to paint an altarpiece for the church of San Francesco Grande in Milan. A first version of the Virgin of the Rocks (now in the Louvre, Paris) was not delivered, for unknown reasons; instead a second version (National Gallery, London) was begun in the early 1490s, and finally installed in the church of San Francesco Grande, Milan, in 1508. 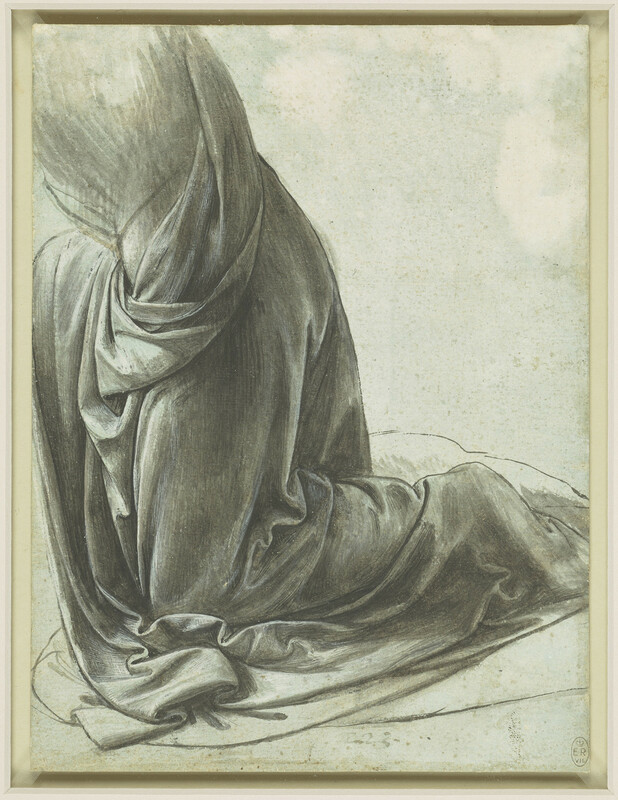 This is a study for the angel’s drapery in the second version of the painting. Leonardo probably arranged cloth soaked in dilute plaster over a small model, which when dry could be studied at leisure. The pale blue ground of the paper gives a mid-tone, allowing Leonardo to explore a wide range of tones using both black ink and white lead paint, applied with a brush. Melzi's 223. The compositions of the two versions of the painting are generally the same, but there are many differences of detail. The drapery of the angel in the Paris version isolates his arm and head, and the expanse of red cloth exaggerates his posterior to an unfortunate degree. In this drawing Leonardo redesigned the angel for the second version, the pose more upright, and a swag of drapery from the right shoulder over the left hip and thigh to break the expanse of cloth. While substantial areas of the London painting were executed by an assistant, Leonardo’s hand is perhaps most easily seen in this passage, an extraordinary depiction of light passing through and reflecting off a range of textiles.